It’s true – one of the few things that rarely goes on sale at Macys is beauty products. Buy today I’m going to tell you how to save $10 on those beauty brands that rarely go on sale. Tonight only, you can take an extra 30% off brands that RARELY go on sale, including your favorite beauty brands, like Clinique, Philosophy and MAC. 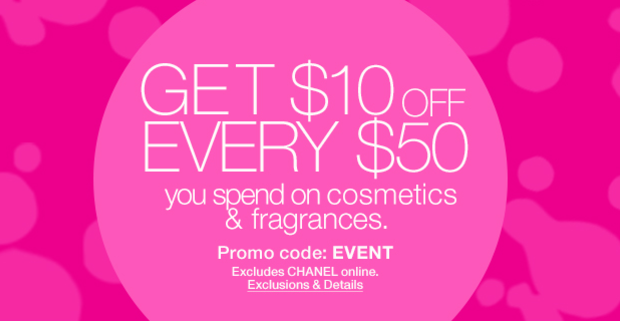 And it’s not just cosmetics, you’ll save $10 off every $50 you spend on fragrances too (excluding CHANEL). If you spend $75 in Clarins products, you not only get to choose 4 free deluxe travel sizes, you also get to take an additional $10 off. Need a gift for dad? You’ll receive a FREE Toiletry Case with any $85 men’s cologne & grooming purchase, plus you can still take an extra $10. And if you love all that’s new and on trend, you’ll save an extra $10 off ALL the buzz-worthy brands that are raising the bar in beauty. But hurry, this beauty deal is only good tonight, so don’t wait too long to start shopping with code EVENT.